The Connect Home's integration with the SmartThings platform makes sense. Samsung isn't content with simply unveiling the Galaxy S8 today. In addition to its latest flagship phone, the company is also showing off a new Gear 360 camera, a desktop dock and, interestingly enough, a router. The Connect Home Smart Wi-Fi System is a mouthful of a name, but the device itself may actually reduce clutter in your home, since it removes the need for a separate SmartThings Hub. Samsung hasn't shared information on price and availability yet, but we do know the Connect Home system will be sold on its own or in a three-pack. A so-called Pro version will also be available. For the uninitiated, SmartThings is the home automation company that Samsung bought in 2014, and it makes hubs that oversee a host of connected devices in a household. The new Connect Home router will have a SmartThings hub built in, so it can communicate with gadgets over Bluetooth 4.1, WiFi, Zigbee or Z-wave. These include things like Philips Hue lights, Netgear Arlo security cameras or Samsung appliances. Once set up, you can control all the connected devices with a smartphone app. The reason Samsung is selling the Connect Home router in packs of three is because, like most trendy routers today, the new device supports mesh networking. 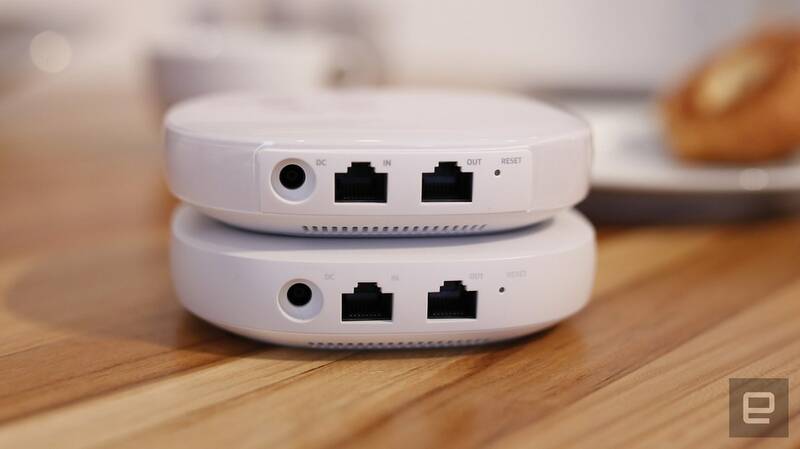 This means you can use one of the Connect Homes as a base to broadcast your signal and then use the other two in the bundle to extend that network throughout your house. Each unit has a range of 1,500 square feet, which is similar to Google WiFi but less than half that of the 3,500 to 4,000 square feet that Netgear promises with its recently released Orbi routers. The Connect Home's design looks very similar to that of mesh networking rival Eero, featuring the same rounded square silhouette and glossy white finish. Like the Eero, the Connect Home offers dual-band 802.11ac at AC1300 (866Mbps) speed, 512MB of RAM and 4GB of storage. But Samsung's option has a slower 710MHz quad-core processor compared to the Eero's. The Connect Home Pro, however, uses a faster 1.7GHz dual-core chip and supports quad-band 802.11ac at a faster AC2600 (1.7Gbps) rate. The Pro version also has the same 1,500 square feet coverage as the original. Both versions of the Connect Home sport two RJ-45 Ethernet ports on the back as well as a power socket. Without knowing how much the Connect Home system will cost, it's hard to judge its value. There is plenty of competition from the likes of Google, Eero, Luma and established router brands like Netgear and Linksys. But the Connect Home is unique in its SmartThings hub integration, which is likely to command a premium. You'll just have to decide whether that convenience is worth the extra money.